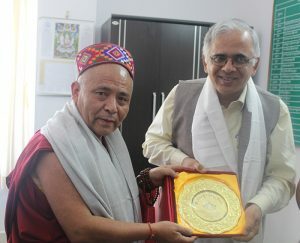 Dharamsala: Dr. Shekhar C. Mande, Secretary to the Government of India (Department of Scientific and Industrial Research) and director general of Council of Scientific and Industrial Research (CSIR) along with Dr. Sanjay Kumar, director of CSIR-Institute of Himalayan Bioresource Technology after receiving a private audience with His Holiness the Dalai Lama, visited Tibetan Parliament-in-Exile at 10:30 am. Deputy Speaker of Tibetan Parliament-in-Exile, Acharya Yeshi Phuntsok received them and explained about the current critical situation inside Tibet, World Parliamentarian support groups and Tibet support groups. 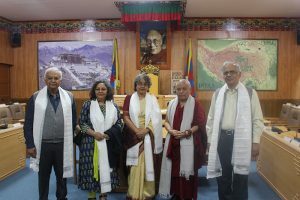 He also briefed how Tibetan Parliament-in-Exile garners support for Tibet by meeting Parliamentarians and general public around the world, and about the structure and functioning of Tibetan Parliament-in-Exile. 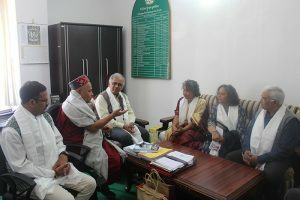 Deputy Speaker also introduced Secretaries of Center Council of Tibetan Medicine and Department of Home (CTA) as they promised to help in their best capabilities regarding Tibet’s unique science of medicine and agricultural development in Tibetan society. Finally, they were taken to Parliament hall and Deputy Speaker presented them souvenirs and books published by TPiE.